A life in a webbis: Honey Creme Ice Cream! Hello friends! I would like to extend this invitation to all of you my blog readers out there. If you have not been following my Instagram and Twitter, you might be missing this news! Do follow my Instagram and Twitter today! By just looking at their menu and pictures and the way they presenting their brand, i believe that this ice cream could captured the hearts of Malaysian generally KL people just in a blink of an eye! I think this brand has made a huge success in Singapore. Therefore, i would like to welcome all of my readers to come and celebrate the opening day of Hartamas Honey Creme this coming Saturday, 19th December 2015 at 12pm. 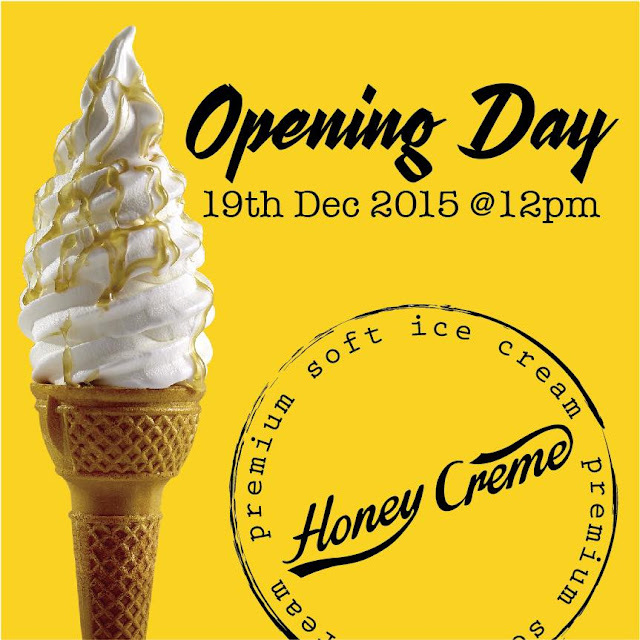 Be the first 100 person to check-in inside Honey Creme Hartamas Facebook page to receive a FREE ice cream. Fret not, if you are not the first 100 person, you are also entitled to get the Buy One, Free One deal only on the 19th and 20th December 2015! Mark your calendar and Pin your Map today! Do follow their Instagram as well. I am warning you, please do not open their Instagram if you are hungry cause all of the pictures looks so delish!